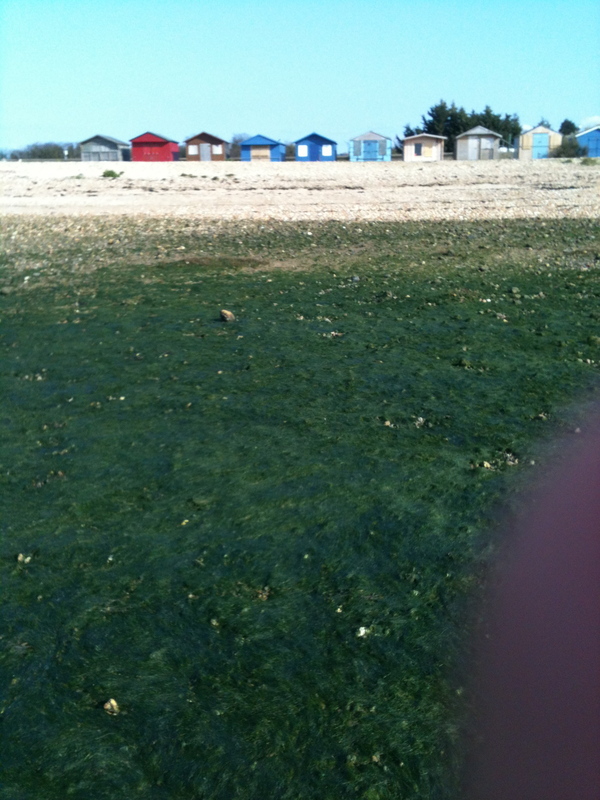 We picked over Whitstable beach, finding empty winkles and oyster shells calcified into heavy white reliquaries. And then between a couple of groynes there was a great green slick of seaweed, like wet fur on the beach. I recognised it immediately as the tai cai seaweed that is a speciality of Ningbo in eastern China, or at least a close relative, and its aroma, when I squeezed a handful of fronds, confirmed it. So we gathered a bagful, and took it back to London on the train, where it perfumed the air in the carriage with its irresistible, almost white-truffly smell, rich and savoury, like the promise of umami. In my kitchen, I rinsed out the sand and seashells in many changes of water, spun it in a lettuce spinner and then hung it out to dry overnight on linen tea-towels spread over a radiator. 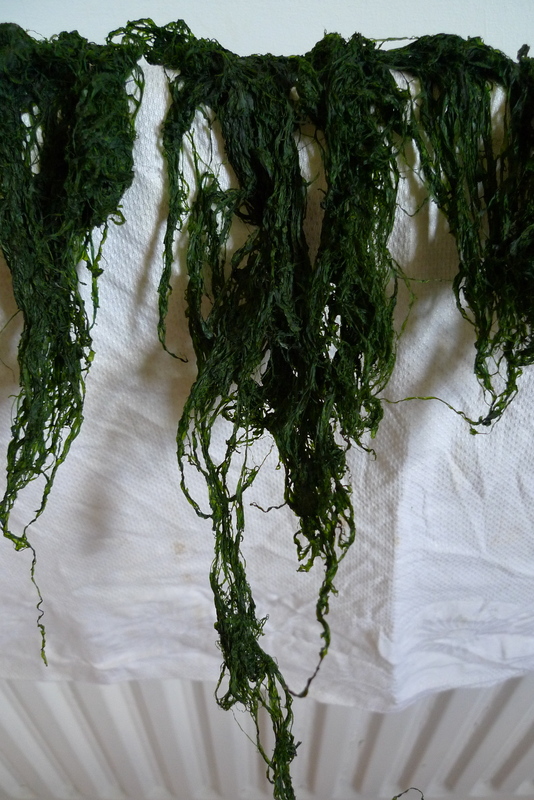 The names tai cai 苔菜, taitiao 苔条 and hu tai 浒苔, all refer to seaweeds from the Enteromorpha Genus (also known as Ulva), which include Entermorpha intestinalis (named for its strandy form), E. prolifera and E. Clathrata. Their English common names include grass kelp, sea lettuce, green string lettuce and sea hair. 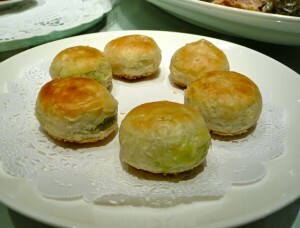 In eastern China, particularly the Ningbo area, they have various culinary uses.They may be deep-fried, sprinkled with sugar, and served with glossy deep-fried peanuts; chopped up and added to a batter used to clothe strips of yellow fish for deep-frying (the finished strips have a lovely speckly appearance); or used in sweet-savoury pastries like these divine flaky-pastry buns from one of my favourite restaurants in Shanghai. This kind of seaweed is, I guess, the origin of the ‘crispy seaweed’ served as an appetiser in Chinese restaurants, which is actually made from other deep-fried greens such as pak choy. if levels were higher, little harm was likely if one was eating them only occasionally. (As I was speaking him, it occurred to me that it was hilarious to be so concerned about the water quality off the coast of England when I’ve happily eaten seaweed from Ningbo!) Fergus rinses his own seaweed in seawater, or failing that in a saltwater solution, so that it retains its sea-salty taste and also keeps better after drying. I’ll know for next time! 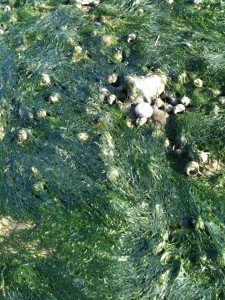 On the left is a pic of some seaweed with peanuts. I also served some, Ningbo style, with slow-cooked pork, but the photo did not come out well… If you want to deep-fry your own seaweed, take care to keep the oil temperature fairly low (about 140 degrees C), drain it well on kitchen paper, and then serve with a sprinkling of granulated sugar. This is real Seaweed, and served with Ningbo style is the best. Forget deep-fried greens such as pak choy or broccoli leaf. The salted seaweed and granulated suger, of course added some peanuts —- perfection! I could just eat some seaweed with peanuts. What a brilliant combination. 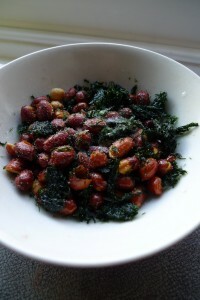 Crunchy & salty nuts must bring out the flavour of the seaweed brilliantly. We picked and ate some seaweed when in Cornwall this Easter. It was the very silky smooth type, don’t know the name but it was fun to do. Not sure I would be too bothered by the health issues over eating it either!